YOU ARE HERE : HOME / FREE MARKET TIPS-BLOG!! / HOW SMART TRADERS MANAGE PROFITS AND LOSSES ? HOW SMART TRADERS MANAGE PROFITS AND LOSSES ? Some of the most successful traders I know and I follow are usually great planners. They knew that trading is a probability game. They are best at keeping odds in their favor.They merge support and resistance, Price action and money management into their strategy, to get positive results from trading. This doesn’t imply that they have to be right all the time. It is impossible to be perfect and right all the time whether it’s trading or any other business. Winning and losing are the two sides of the same coin in trading. In fact,I have been there and experienced it. Certain times, I visualize profit streaks nearly around 10- 15 trades. On the other way, I have experienced bad days, even bad weeks constantly without any profits! Circumstances like these are common to everyone. Time won’t differentiate between retail traders and Institutional traders. 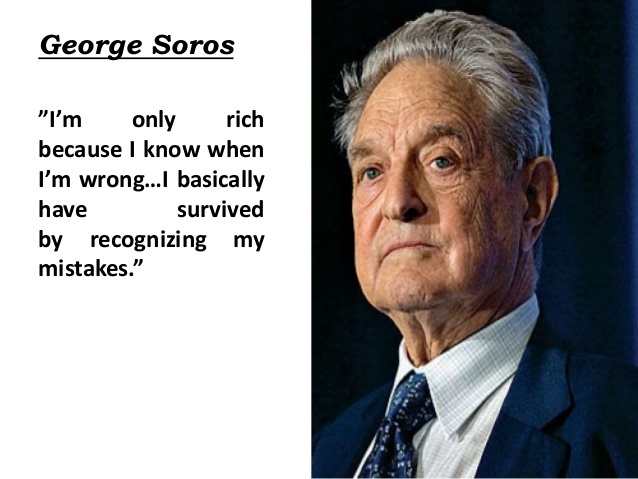 Even Multi billion hedge fund manager, George Soros himself is not an exception to these circumstances. Take his own words.. If this is the case, then what separates successful traders from unsuccessful traders- during these circumstances? IT’S ALL A MATTER OF MANAGEMENT. Better management of profits and losses are the fundamental facts which separates successful traders from gamblers. HOW TO MANAGE BETWEEN PROFITS AND LOSSES IN PRACTICAL TRADING LIFE? From the perspective of Money management. From the perspective of Emotion. MANAGING FROM THE PERSPECTIVE OF MONEY MANAGEMENT. The Markets will move as per their own tendencies rhythms and structure. Our Job as traders is to make sense of certain market movements and profit from those movements, with a concrete trading plan or strategy. As we all know, money management is a part and parcel of a successful trading strategy. Through Money management, we can take following steps to strike a balance between Profits and Losses. Analyze the Risk involved in a trade- Before an entry. Have a Fixed Risk size on of your capital. (2% risk out of your capital is optimal) Don’t go all in- like a gambler. Trade the Plan, Plan the Trade. Of course this is difficult in practice, but not impossible. You need to do some work in order to get paid by Mr. Market. Following these suggestions, would help you to maintain a healthy money management approach. A good and reflective money management plan will help to strike an efficient balance between profitable trades and losing trades. These are the money management practices of some smart traders. I use them consistently in order. Following them is a must and should practice. Remember you’ll get paid by the market, if and only if you do the job properly. Trading is not just entry and exit. Money won’t flow from heaven, After you find a successful trading approach. As per my experience, a successful trading involves-50% Methodology,25% Psychology and 25% Money management. Psychology is very important and essential. Of course, it is often misunderstood about Trader’s psychology. A common misconception is trader’s psychology consist only greed and fear. But the fact is- more powerful cognitive biases haunt traders, more than any other professions. When we traders, prepare for a trade either we are over-confident or fearful. We can’t have balance like a Zen monk. Often traders are prone to gambler’s fallacy. Certain times, when Markets are boring-Traders tend to be ignorant and lazy. When markets become volatile, traders act with over fear or greed. We read all the great psychological books ever written in the trading literature, but when it comes to practice –it’s just one way in and no way out. Observe your mindset during losses and profits. Be patient – Be consistent. It doesn’t matter, how many times traders hear these words. You need to practice them. There is only one tip from me on this perspective, Master your mind and body. If you have any queries or feed backs, point out from your comments below. 6 Must read Trading Books for Traders and Investors.